As some of you know, this blog was first inspired by Animal, Vegetable, Miracle by Barbara Kingsolver. Her book caused us to become gung-ho locavorists. We developed our own rules (based on Kingsolver’s suggestions), created more garden space in our yard, and built a green house. We treked to farmers markets every weekend. Since that time (has it really been seven years??? ), we have fallen off the bandwagon a bit. I wish I had read Robin Mather’s book first. Then, we might still be dedicated. Mather is plain spoken and although passionate about her lifestyle, she is not preachy or judgmental. She is practical. I learned a great deal from her such as trying to purchase cheese trims from a local cheese monger, drying cherries, and making mead. I love that she also likes to have a meal of “nibbles” in the summer months. And, I applaud that she not only advocates for local farmers, but also for local purveyors and businesses like grocers, millers, and meat packers. I have a new idol in Mather. My new favorite chapter “On Thanksgiving and the Local Table” (186) where she lays out her new tradition of celebrating solo. A year ago, I highlighted my then favorite chapter, “On Snapping Turtles and Strawberries” (18), as Mather discusses another tradition—having strawberry shortcake for dinner to celebrate the first berry harvest. We have definitely adopted the latter tradition and am seriously thinking about taking on a solo-Thanksgiving. I can’t think of a better way to quietly reflect. I want to make her Espresso Walnut Scones (58) and Honey-Oat Bread (168) just to name a few of her recipes, but what did I land on for this Cook the Books post? Marinated Grilled Leg of Lamb (74-75) was my challenge. Combine the olive oil, lemon juice, onion, garlic, mustard, spices, salt and pepper in a food processor. (Make sure it is a large one because this is a lot of marinade. A blender may be used as well.) Process until well-combined but some chunks of onion can remain. Heat a grill to 300 degrees. 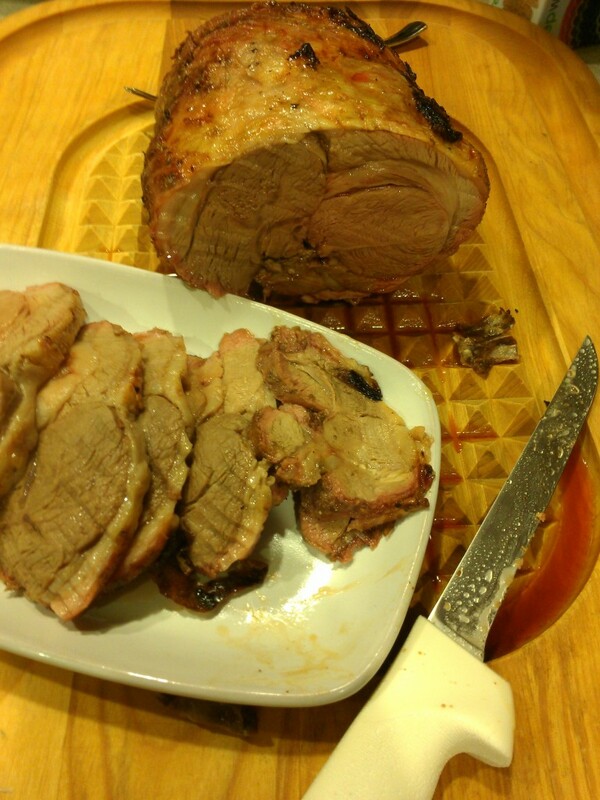 We used our retro ceramic cooker, similar to a Big Green Egg. 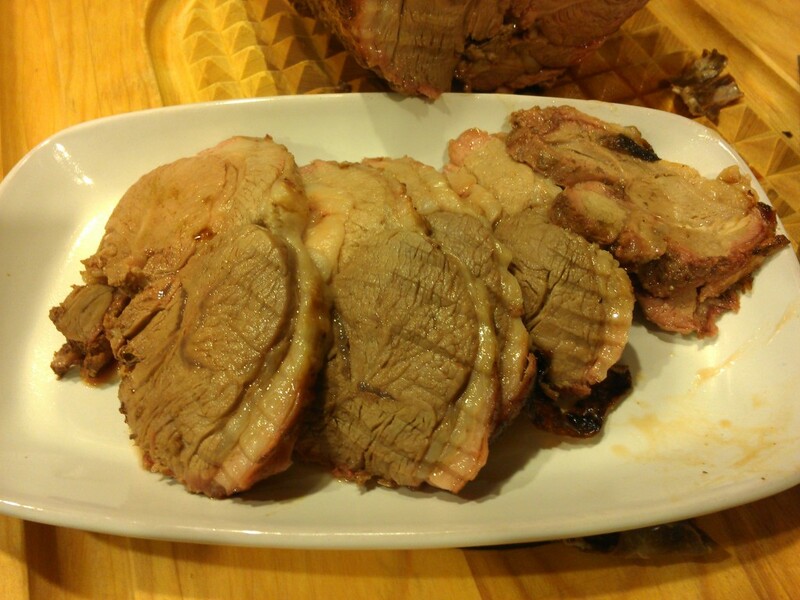 Place the lamb on a small aluminum tray and cook for two hours, turning the roast after the first hour. Cook until an internal temperature of 140 F. is reached. Remove from grill and let rest for 10 minutes. For her original recipe, click here. As Mather states about her own life challenges, “We often don’t grow without a push” (187). The Feast Nearby is my push to rethink and rediscover supporting local farmers, growing what we can, and supporting local vendors and businesses. In short, we will try to live by Mather’s good and practical example. To qualify the above declaration, this will be easier to do now that summer and the growing season is just around the corner. 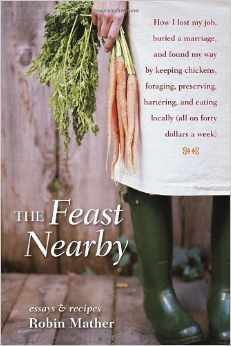 It is not to late to grab a copy of The Feast Nearby. It is a quick read and has some marvelous recipes included. Just post your Mather-inspired dish by June 1st and you are in the running. I promise you will enjoy this practical, informative, and inspiring book of essays and recipes. If you’re new to Cook the Books, please check out About or Guidelines or simply leave a question in the comments below. Once you post, just shoot me an email at eliotseats@gmail.com. And if you want to work ahead, please join CTB for the June/July round hosted by Simona of Briciole. Simona has chosen The Wedding Bees: A Novel of Honey, Love, and Manners by Sarah-Kate Lynch (2014). I have started it and will probably have it read by the time this posts. A very enjoyable read, I must say. Postscript: This was the first lamb dish I have ever cooked. It was a tremendously successful first time. (Please don’t judge the photos…it was the perfect with just a bit of rareness. We served the lamb for Easter dinner with Sriracha-Honey Roasted Sweet Potatoes (which actually did come from our garden and have been stored in the garage since our harvest) and Curried Quinoa Salad. Well for your first lamb dish it sure looks good! We are big fans of lamb and use it ground in rage and shepherd’s pie, grilled chops and a roast as you have expertly prepared. Nice job! I can’t get that book at our library but will wander to the bookstore and see if I can get it in time. I wish we were close enough and I would send you my copy to borrow. Greece is a big lamb consumer! It looks very juicy and tender Debra! Beautifully cooked! I take that as a true compliment coming from you, Katerina. Sounds like a terrific book. And I love lamb — maybe my favorite red meat. Although goat is up there, too. 😉 Good stuff — thanks. I’m all about buying local and need to be more disiplined about the whole thing. Sounds like a great book. I grew up on lamb and it’s one of my favorite meats! Sadly, no one else (husband) likes it, so I could never make this recipe. But it looks fabulous! Good to know about Robin Mather – thanks! Well, maybe you could grill a small chop with this marinade. Thanks so much for hosting this month. I enjoyed the book very much. This was a delightful read. Really enjoyed it. Bookmarked a few of her delicious recipes! I do love lamb, so glad yours turned out really well. And, those Sriracha honey roasted sweet potatoes sound great. Always looking for good sweet potato recipes. Looks beautiful & Those potatoes sounds heavenly too! Congratulations on your leg of lamb. Being basically vegetarian means that cooking meat is a daunting task for me, to be approached quite carefully. I think each of us eventually finds the right balance that works with the rest of our life. For example, since I cannot keep animals, I try to support who does. But I think it is a good experience to try various things, even just to learn how much work they are. Glad to read you are enjoying The Wedding Bees. That leg looks perfect. I love lamb. The Hubs, not so much.